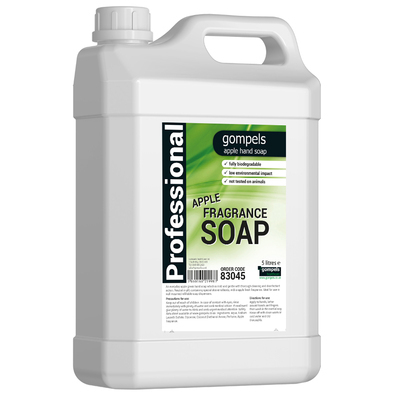 In kitchens with high quantities of washing, our Gompels Liquid Soap Apple Fragrance offers a highly economic alternative to smaller bottles. The durable plastic container boasts a comfortable handle which allows it to be distributed into smaller container while a screw down lid provides secure storage. With it's mild and gentle formulation, the liquid soap offers hard working cleaning and disinfection action with it's PH neutral blend and added skin emollients. Scented with a rich apple fragrance, we have designed this soap to be compatible with our wall mounted refillable soap dispensers to reduce wastage and ensure the correct dose for every single user. This liquid soap is compatible with both our Soap Dispenser in Brilliant White and our Soap Dispenser in Silver. It also comes in a Baby Powder Fragrance for alternative washing options in your work environment.